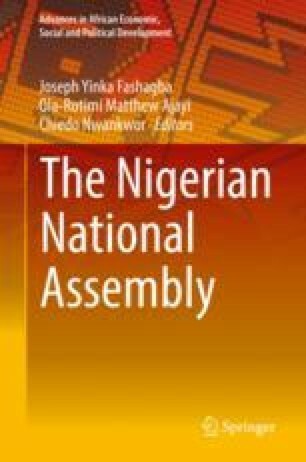 This chapter attempts to historicize the legislature, lawmaking and legislation in Nigeria. It contextualises the legislature’s environments, establishes a nexus between the legislative structure and political as well as constitutional history, as Nigeria oscillated between parliamentary and presidential systems and repeatedly transited from military to civil rule. It advances discussion on how and why similar institutions work in different contexts. As a follow-up to existing works in the field, the chapter engages existing literature and media resources on legislative procedures and processes. The relevance and significance of the legislature at the national and subnational levels cannot be overemphasized given the extensive powers vested in legislative institutions amidst broad range of functions. This reality is a function of history, tradition and circumstances of the prevailing system of rule. The Nigerian experience in legislative practice started with the legislative council established in 1862 by the British colonial powers to function exclusively in advisory capacity. The subsequent national council was instituted for reasons of all-inclusive representation of the subunits. Successive legislative institutions thereafter, progressively gained wider currency with legislative authorities being symbols and agencies of popular participation from colonial through immediate post-independence, First, to the Second, Third and ongoing Fourth Republics. During the military interregnum, other institutions existed at the expense of the legislature, as executive in collaboration with judicial authorities usurped legislative powers and functions to arbitrarily promulgate Decrees and Edicts. The 1999 Constitution institutes bicameral national and unicameral subnational legislatures with provisions under Section 4(1-2) to reflect size and diversity. Legislatures have since progressed steadily from relatively timid, inexperienced, fragmented and chaotic lots to becoming increasingly visible, coordinated and formidable. Notwithstanding initial setbacks, many are now better equipped to function effectively. Legislations of economic and social significance, as binding measures of public policy and legislative interventions during national emergencies have further enhanced the prominence of the legislature. From the number and quality of bills intake, deliberations, interest generated and attracted through oversight, and from its representative credentials, as interface between the government and the electorate the legislature holds promises for the continued survival and sustainability of the system, which depends on it. This chapter drew inspiration and benefitted from a paper by this author on the topic: “The Nigerian Experience in Legislative Practice, Process, and Legislation”, African Journal of Politics and Society. Volume 2, Number 3, July 2016. pp. 49–97. The chapter is also a follow-up to similar works by the author on the subject matter.